Little more than two years ago the Streets of America closed for construction to begin on Galaxy’s Edge. While it has only been two years, at times it can feel as if it has been much longer, especially when you consider how long some of the experiences had called the area home. One such attraction, the Honey, I Shrunk the Kids: Movie Set Adventure, had been tucked away behind a façade since December of 1990. 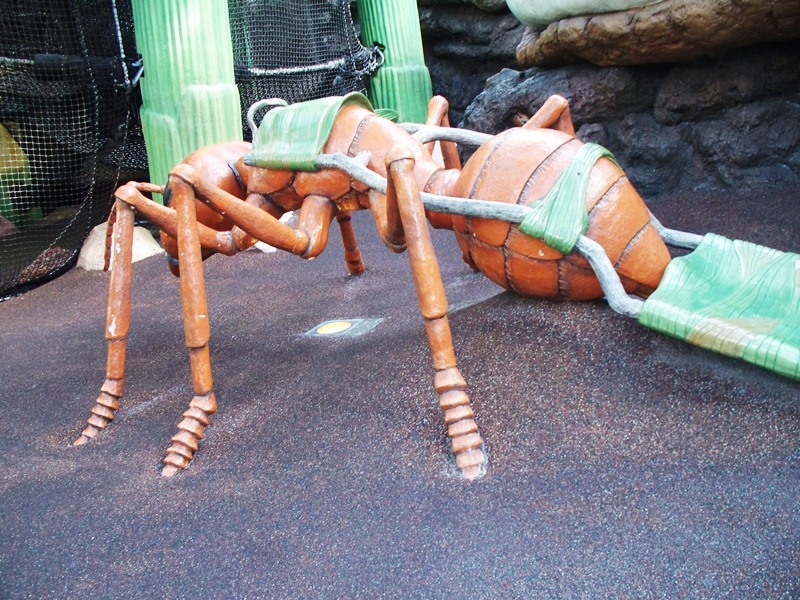 Taking its cue from the Honey, I Shrunk the Kids film, the playground shrunk guests down to the size of an insect and turned them loose in a backyard complete with lost toys, film rolls, insects, and a giant dog nose. The absurd seemed commonplace here, and even when some of the props didn’t age well (film, in 2016?) and the film mostly vanished from the lexicon, it was always a pleasure to play in this oversized wonderland. Because of its location, tucked away between a building front and a quick service restaurant, its ability to draw guests in struggled as the years went by. But those who took the time to explore the backyard scenery found a place filled with amusement. The smaller size of the guest allowed for many over-sized gags throughout the space, and I would suspect many gags of a similar sort will be utilized in Toy Story Land when it opens later this year. 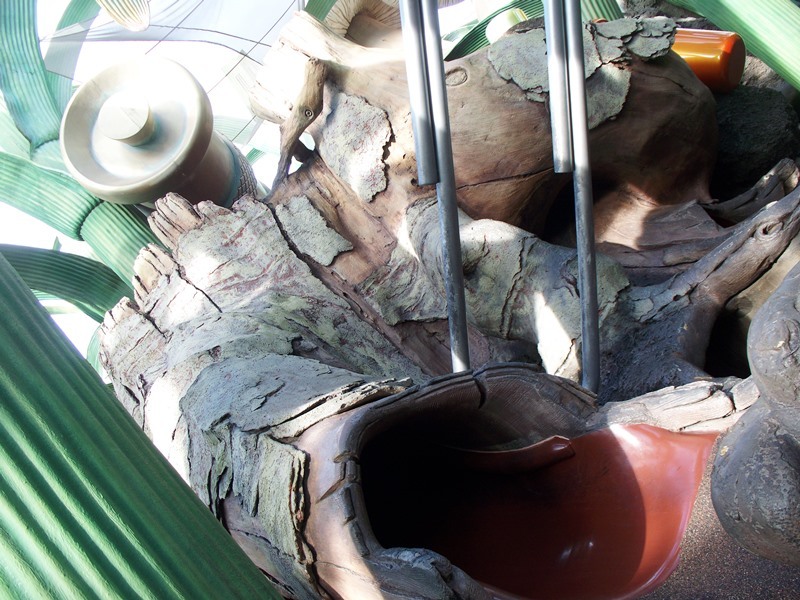 Let’s look back over the years and tour the Honey, I Shrunk the Kids: Movie Set Adventure in its heyday together. Palo, the Northern Italian fine dining experience, can be found onboard all four of the Disney Cruise Line ships. Its name is derived from the long poles used by gondoliers as they ply the waterways of Venice, and all the elegance Venice has to offer is captured in the sumptuous surroundings, art, chandelier, vistas, and service. Dinner is a nightly affair, where the tiramisu and chocolate soufflé reign supreme, but brunch is undoubtedly the true star. 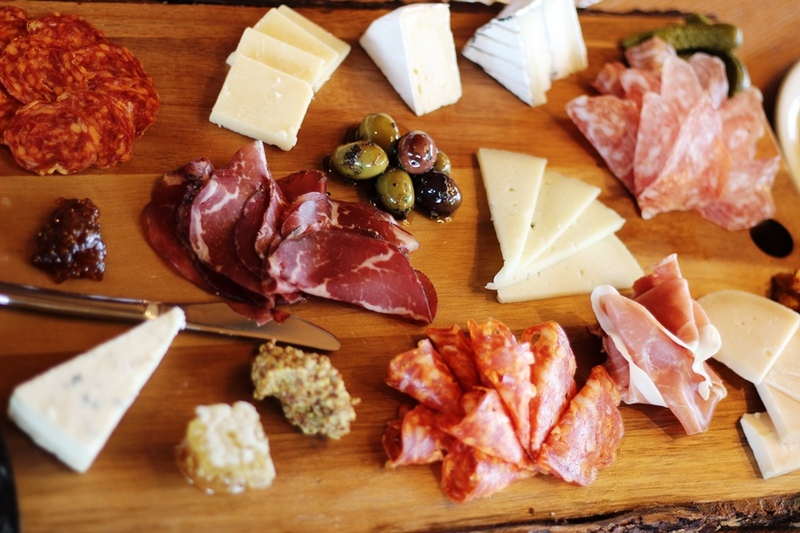 Copious amounts of desserts, meats, seafood, cheese, breads, pastries, and even caviar are just the start. 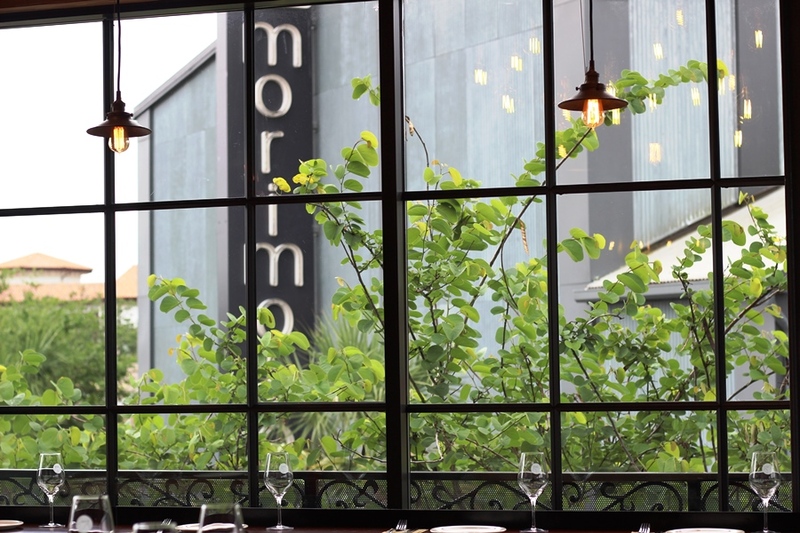 A full menu of pastas, pizzas, and Northern Italian specialties await. 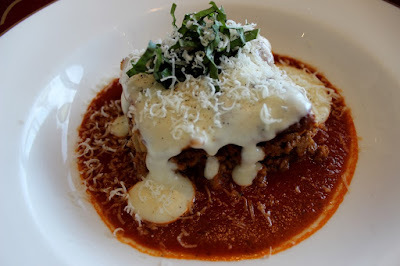 While there was a lot to sample and love, the one dish that blew me away was their Lasagna Bolognese. I’m going to start by saying this dish was recommended by our server, who was simply wonderful from beginning to end, but it took some convincing. Lasagna and I are not on the best of terms, and haven’t been for most of my life. I believe it stems from my distaste for ricotta cheese, which I understand can be heresy, but something about it just never sat right with my palate and my stomach. I was presently surprised when I was told that this was a more traditional recipe that utilized béchamel, not ricotta. For those not in the know, béchamel is a white sauce comprised of flour, milk, and butter and while it sounds easy to make with just three ingredients, it is not. It has been a specialty of Southern France and Northern Italy for centuries and is considered one of the mother sauces. My grandmother, who grew up in Marseille, raised me on her family recipe. From the moment I heard that béchamel was utilized in Palo’s Lasagna Bolognese, I was sold. Speaking from experience, whatever your preconceived notions are about lasagna, you can throw them out the window before ever taking a bite of this dish. For starters, the layers of lasagna noodles are tender, but not soggy. They will not break apart and crumble from the rest of the ingredients and the time it takes for them all to cook up together, they are firm and hold the layers together wonderfully. The Bolognese is more meat than sauce. The base is a blend of ground veal, pork, and beef, with great seasonings and a little bit of tomato thrown in for good measure. Don’t worry, there is plenty of marinara spread around the plate for those who need a nice balance. The aforementioned béchamel is the warm blanket that covers each piece of Lasagna Bolognese as it leaves the kitchen. It is rich, extremely so, but smooth and full of buttery goodness. Some final touches of fresh chopped basil and parmesan grated tableside and you have yourself a plate that is almost too beautiful to eat. Don’t you worry though, I cleaned my plate and thoroughly enjoyed every bite. Since I am on the record as not being a big fan of lasagna, telling you that this is my favorite lasagna ever seems to be ring a bit hollow. So, let me put it this way, Palo’s Lasagna Bolognese is arguably the best pasta dish I’ve ever put in my mouth, save for only a meal or two I had in Florence or Venice years ago. It took me right back to my grandmother’s kitchen, which is more than I could ever ask of a single dish, but there you have it. It made our server very happy that I ordered his recommendation, but I think of the two of us I came out much further ahead in the long run. If you have an upcoming cruise, or even if a cruise is further down the line for you, I cannot recommend the brunch at Palo enough. If you are able to secure a brunch reservation, please take this piece of advice and order the Lasagna Bolognese. I would be shocked if you were disappointed, because I am still having dreams about that lasagna all these months later. It’s rather wet at Walt Disney World right now, which means plans are being altered and some guests are staying away from the parks or not resort hopping as a result. As a native Floridian, I know that rain is part and parcel of the gorgeous tropical scenery, but it does tend to put a damper on a vacation. It is the reason I always over-pack on clothes, particularly shoes and socks, and while I may end up with some pruny toes, I don’t want to end up with a wrinkled holiday. Here are a few of the things that I do during rainy weather that may help you the next time stormy weather blows through while you’re in the Vacation Kingdom. 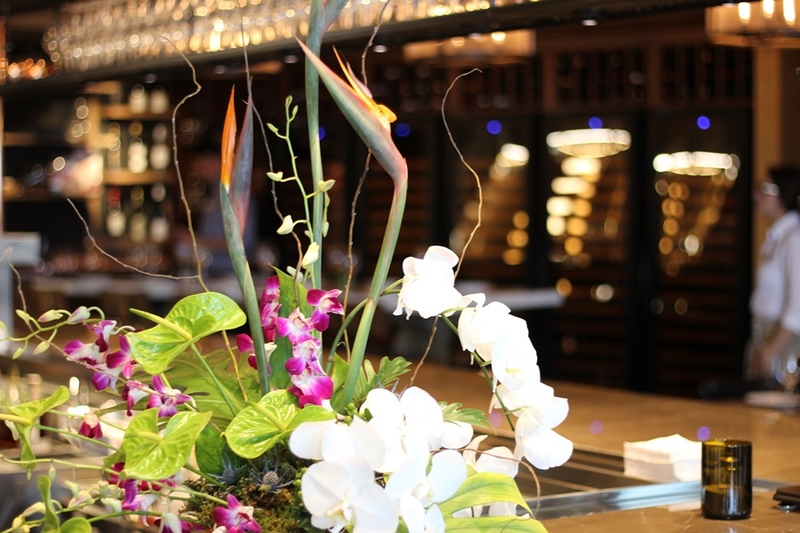 Lounges – Finding a place for a nicely crafted cocktail and maybe a nibble or two is an absolute must during a rainstorm, particularly if that lounge offers a view of the outside world. My top recommendation, if the rain isn’t driving in on you, is to find a cozy seat on the porch of Nomad Lounge in Animal Kingdom. Other highly endorsed options include Outer Rim in the Contemporary, BoardWalk’s AbracadaBar, and the Rose & Crown in Epcot. There are also tons of options in Walt Disney World’s food theme park, aka Disney Springs, so you’re sure to find a place to weather the storm in style there as well. Long, Interactive Queues – We spend a great deal of time trying to find the best way to avoid lines for attractions, but when the weather is soggy, that is the perfect time to jump in line and explore the story and interactive elements present in some queues. Peter Pan’s Flight, Frozen Ever After, and Flight of Passage all have amazingly detailed queues that are just waiting to be explored, and they will definitely help you forget about the passing rains. Shows – Shows are often hit or miss during any trip, you may want to see one, but how much of your trip time are you willing to dedicate to them. If you’re like me, you end up haggling with your party and settling on one or two as a compromise. Rainy days are perfect weather to spend some time enjoying these offerings, particularly in Epcot and the Magic Kingdom. While the films and performances of World Showcase could occupy quite a bit of time, I prefer splashing through puddles in the Magic Kingdom as I make my way from the Enchanted Tiki Room, around the corner to the Country Bear Jamboree, a quick dash over to Philharmagic, and then one last brisk walk to finish at Carousel of Progress. You Will Get Wet – Since you are already going to be wet, you might as well make the most of it. In this case, I mean hopping onboard a log or raft and experiencing Splash Mountain and Kali River Rapids. 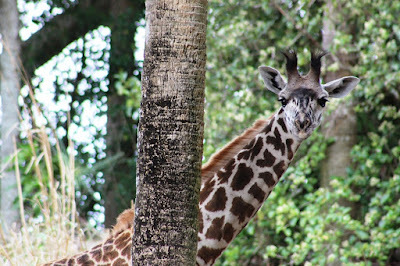 Typically with these attractions we try to avoid getting soaked or nervously hoping that someone else is the one who is going to get drenched. 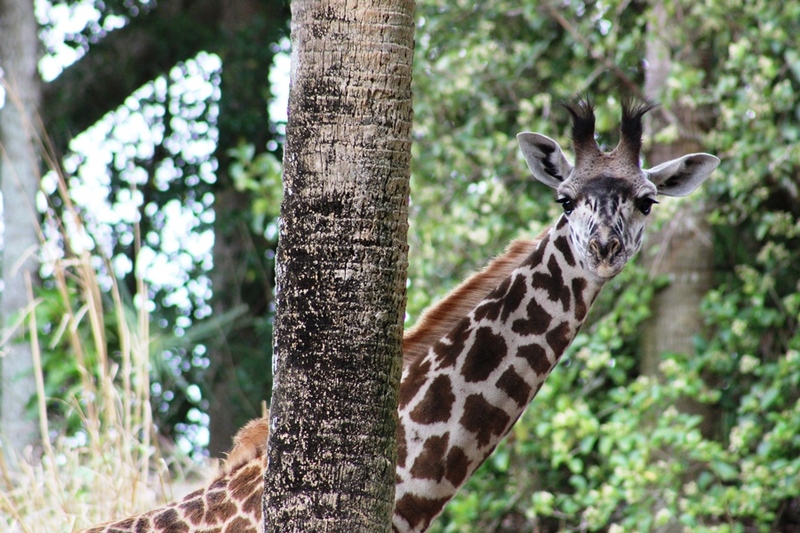 Since you’re already soggy, go ahead and give these attractions a go, provided that it is a rainstorm and not a thunderstorm (in which case they would be shut down anyway). I promise these will be some of the most laugh-filled and joyful times you ever have on either of these attractions. Dark and Stormy Nights – If you’re like me, the disconnect between what’s happening outside an attraction and the story being presented inside an attraction can sometimes be a little off-putting. 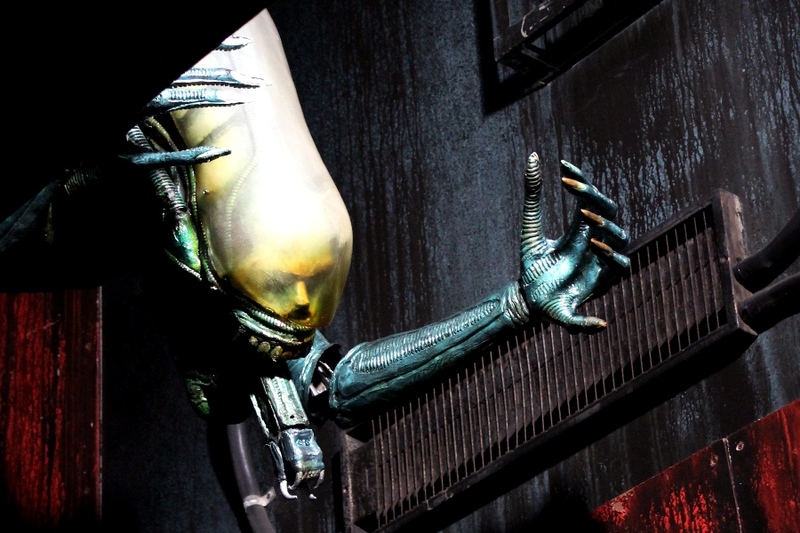 That or I’m just a complete nitpick… If the weather outside is going to be frightful, then why not head into attractions that live in a world where it’s a dark and stormy night? The Haunted Mansion and The Twilight Zone Tower of Terror are perfect stories to jump into when the rains are coming down outside. Exhibits – Often bypassed, there are plenty of places throughout Walt Disney World where you could learn something during a rainstorm. You’ll be safe, dry, and come away with newfound knowledge. The prime examples of these exhibits are present in many of the pavilions of World Showcase, where you can learn a great deal about the history and culture of a given country. Similarly, you could spend a good deal of time in Walt Disney Presents at Disney’s Hollywood Studios. Stick to Your Plan – When it storms, many guests tend to huddle at their resorts or, if they’re local, waiting for the rain rain to go away before they come for a visit. That means that crowds tend to be a little lighter on wet days at Walt Disney World. You’re there to experience all the parks and resorts have to offer, so regardless of the weather stick to your plans as best you can. It may not be the perfect vacation, but you’ll still be making memories and that’s the most important part of the trip. I hope these ideas help you get in the mood to splash in some puddles and play through the rain. 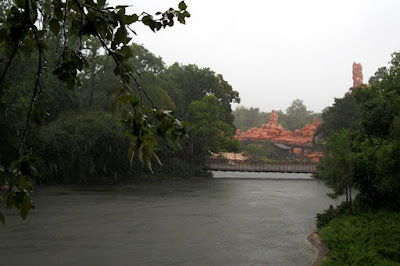 When the rains happen at Walt Disney World, and they are bound to happen sooner or later, there’s no denying that it is a bit of a letdown. However, at that point the trip becomes more about what you can make out of it. Don’t let it be the thing that ruins your trip; instead try to find ways to use it to your advantage. You will come away with stories to tell and memories to share. Today we can play with coloring pages of every sort and difficulty directly on our phones or tablets with more colors than in a Big Box from Crayola. It is as simple as opening an app and the colors appear with a tap of our fingers. Not so long ago, however, the idea of being able to color in a digital space seemed far away from our living room floors, broken crayons, and coloring books. Unless, that is, you happened to be visiting EPCOT Center and made your to the second floor of the Imagination Pavilion. 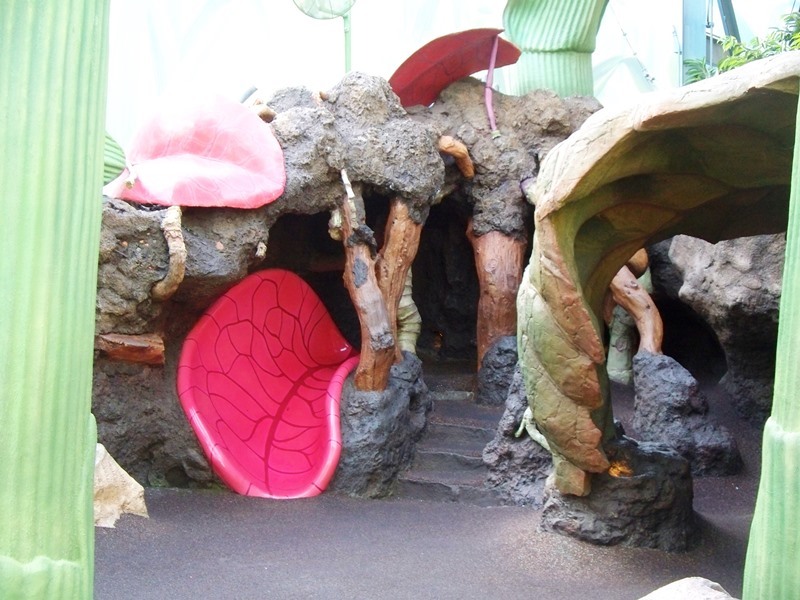 This space, known as the Image Works, was home to a blending of artistic forms, sensory experiences, and fun. 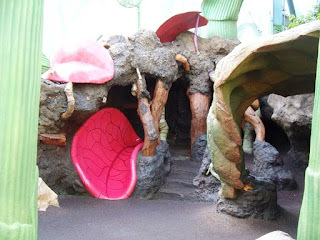 Here a child could help put on a small theatrical production on a green screen, run through the Rainbow Corridor, and create sound with bubbles (one of my personal favorites). Guests could also digitally color with Figment’s Coloring Book. At Figment's Coloring Book, guests would start by selecting their blank picture to color. 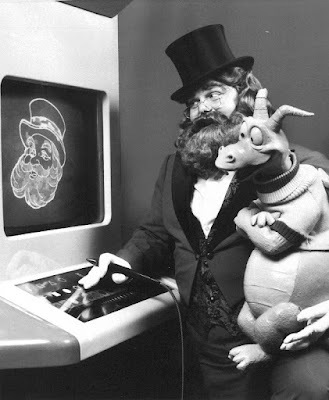 The images included Figment, Dreamfinder, and even the Imagination Pavilion itself. A stylus was connected to the machine and became the guests’ paintbrush. On the panel in front of the image guests had the ability to select from a wide range of colors, but also shapes that you would like to draw in. The circles, squares, triangles, and octagons could all be used as base shapes, and could even be completely filled in or left as outlines. In fact, there was even a Figment shape that you could use to color with. On more than one occasion my screen was an Imagination Pavilion filled with Figment stamps. There were plenty of ways for a guest to finesse their drawing skills, but more often than not, each picture had a wonderful outline with large swathes of bright colors strewn across it. Most guests didn’t stay within the lines, but it didn’t matter because they had a smile on their faces. The sheer size of each station at Figment’s Coloring Book made it seem as if this technology would never make it into our own homes, much less our pockets. Yet, today coloring apps are amongst some of the most popular available. While some of the experiences in the Image Works were pure works of fun and imagination, others were a bit ahead of their time. Now, if you’ll excuse me, I think I hear a Big Box calling my name. Disney’s Hollywood Studios is, even today, filled with glitz and glamour of Hollywood’s golden age, including leading ladies and gents. 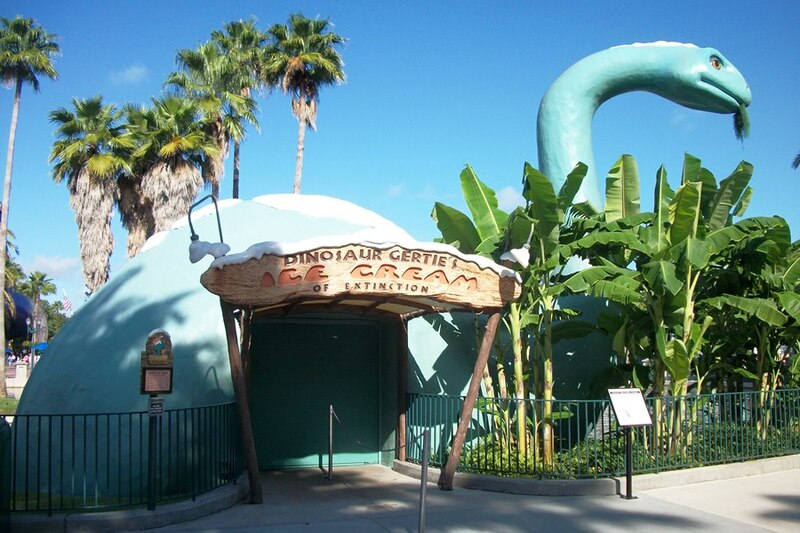 Perhaps the biggest start to call the park home, however, is none other than Gertie the dinosaur. This gorgeous in green creature has made her way to Echo Lake, apparent from the footprints that have cracked the pavement, and seems contented to remain there and sell ice cream. Gertie actually serves a dual role for the park, as she is an iconic film salute and is the living embodiment of an architectural movement. Gertie was the star of the 1914 film Gertie the Dinosaur, created by Winsor McCay. With a runtime of 12 minutes, Gertie the Dinosaur was one of the earliest animated features. The film started out life as a gimmick reel projected behind a vaudeville act that would appear to interact with the activities taking place on the stage. Later, McCay would create a live-action introduction scene for the film to stand on its own as a theatrical release. A sequel to Gertie the Dinosaur, Gertie on Tour, was planned but never realized. While the figure at Disney’s Hollywood Studios appears to be very stoic, the real Gertie was much more childlike. Throughout the short, the long-necked dinosaur performs tricks like bowing on command, launching a mammoth into a nearby lake, throwing boulders, and taking long drinks of water. She enjoys pumpkins, is easily distracted by flying creatures, and cries when her feelings get hurt. 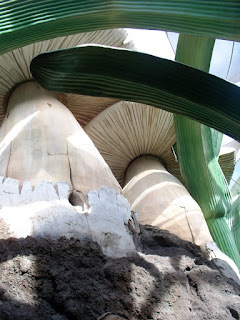 The other space in history occupied by Gertie is the architectural movement known as California Crazy. While novelty construction, that is large structures built to resemble an animal or inanimate object, had been taking place all over the globe since the 18th Century, the explosion of the art form really took off in California during the 1920s through 1940s. The idea was to catch the eye of the passing motorist and draw them in to your restaurant, attraction, gas station, or the like. For some it was very transparent, the large hamburger selling hamburgers, for others it was more in the name, like the brown derby of The Hollywood Brown Derby. The style faded over time, but Gertie is a prime example of what roadside architecture could resemble during the era. 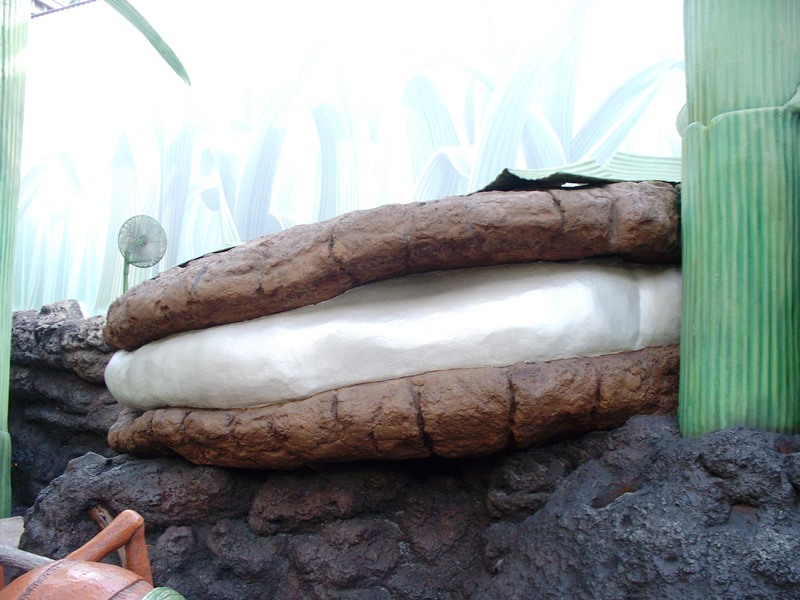 Gertie is a classic example of Walt’s idea of a weenie, the idea of creating something that would be a visual magnet to guests and draw them further into a land or location. The concept comes straight out of the California crazy building boom, and Gertie comes straight out of the annals of animation history. If you ask me, Gertie is almost a perfect summation of a time when the lights of Hollywood never seemed to dim, and she has definitely earned her place in Disney’s Hollywood Studios. There are some swanky places to eat at Walt Disney World and then there are those places that I try to steer people away from. Morimoto Asia definitely falls into that first category. 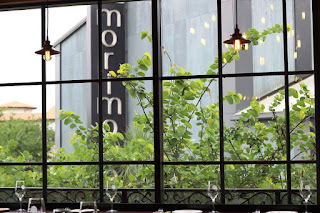 On a recent trip, I decided to step away from my preference for visiting Morimoto Asia for dinner, and my preference for duck and ribs, and instead have a relaxed lunch. In our tradition of pairing menu items with cocktails, I opted to select one of the house specialty drinks and pair it with something from the dim sum menu. 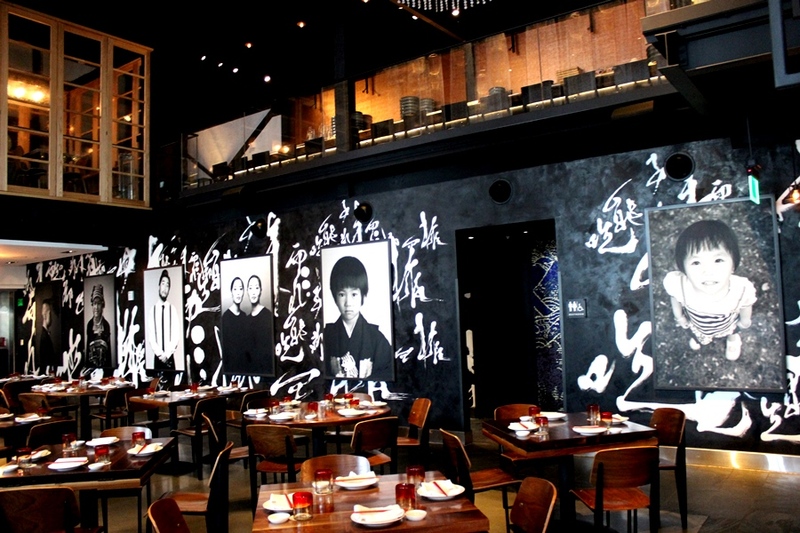 The results, as has everything at Morimoto Asia, did not disappoint. I started out with the Manhattan East. As the name suggests, this cocktail is a variation on your typical Manhattan. I’m more of an old-fashioned person myself, but this beverage had a few of my favorite things: bourbon (Maker’s Mark, which is a fine standard, even if I prefer Woodford Reserve as my go-to), junmai sake, ginger, and orange. This is, as you could guess, a very strong drink. 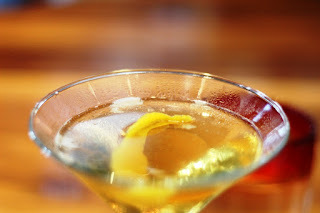 However, the spirits in this concoction aren’t the main flavors, instead the orange is towards the front, particularly when it comes to scent, and the spiciness of the ginger really fill out the palate in this cocktail. If you’re not a fan of sake, then definitely don’t try this one, but if ginger and orange are flavors you like highlighted in your drinks, then this is an absolute winner. From the dim sum side of things, I opted for something a bit simpler, the Chicken Bao. This dish comes with two fluffy buns filled with lettuce, cucumber, spicy mayonnaise (which I appreciate it being listed as instead of trying to fancy the description up by using the word “aioli”), and teriyaki chicken. The two buns are enough to share before a larger meal or to eat on your own, while still not entirely filling you up. As with all dim sum, my feeling is the more you order, the more you share, and the more you get to try. However, for today’s purposes we stuck strictly to the bao bun themselves. The heat from the spicy mayonnaise was nice, but not overpowering, it sort of just tickled at the back of my throat. The lettuce and cucumbers added a cooling element, both in terms of temperature and on the heat spectrum, and a crisp bite that is the opposite of the texture provided by the bun. Speaking of, the bun was pillowy in all the right ways that you want a steamed bun to be. Lastly, the namesake of the Chicken Bao, aka the teriyaki chicken, was excellent. There is always a concern that teriyaki chicken is just going to be beaten down by an overly salty sauce, and that was not the case here. While the teriyaki sauce does lean towards the salty side of the taste range, it isn’t overboard and actually serves to highlight the spices in the sauce and the inherent flavors of the chicken. The chicken, by the way, is thickly cut and incredibly juicy. 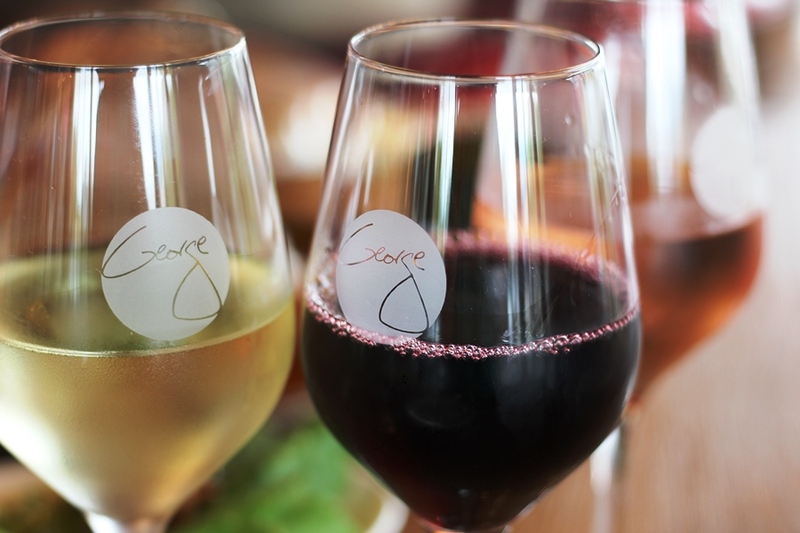 I couldn’t have picked a better pairing if I tried, although I imagine there aren’t a lot of bad pairings coming out of the kitchen and from the bar at Morimoto Asia. 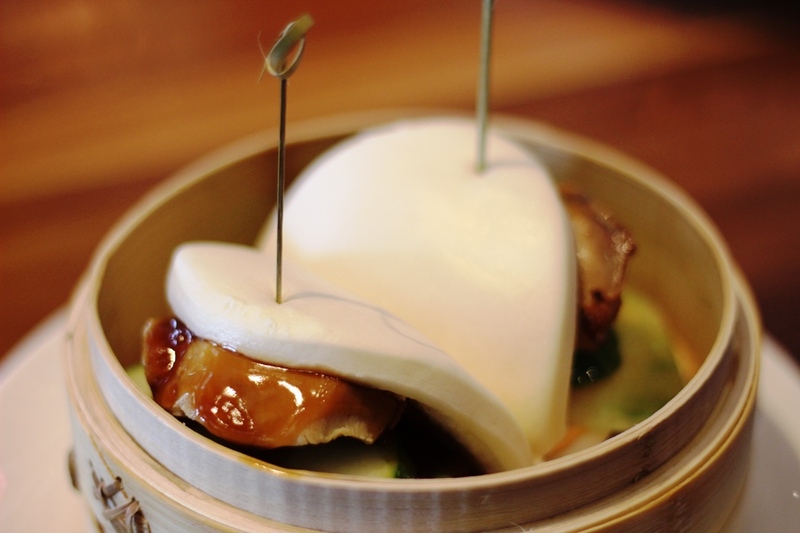 The sour and bitter elements in the Manhattan East mingle nicely with the savory and salty bits of the Chicken Bao. This is a pairing that I would definitely order again, although with such an expansive menu, I do find myself continually trying new things at Morimoto Asia. Star Tours will, to paraphrase another attraction, soon become a quaint exhibit sectioned off from the rest of Galaxy's Edge. 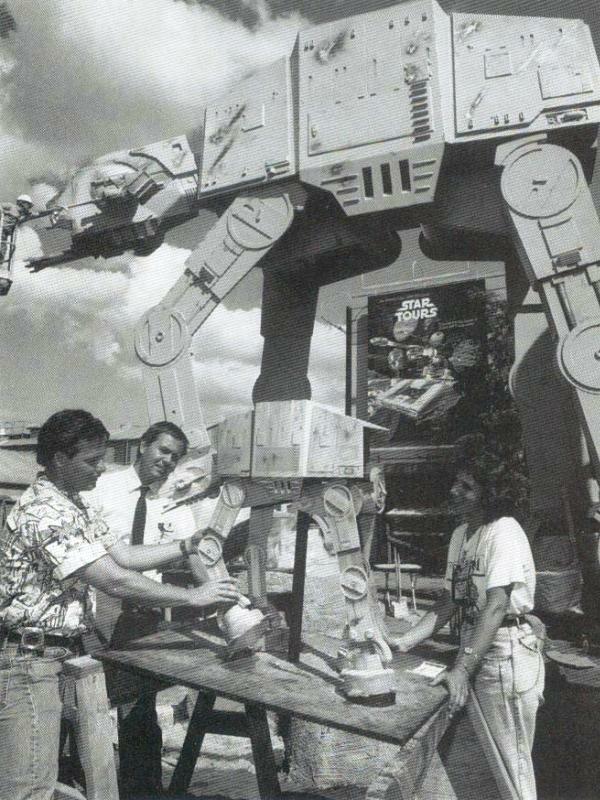 Still, it has been way to experience the Star Wars universe at Disney's Hollywood Studios since December 1989. A Monumental Addition was an article we ran during the time between the original Star Tours closing and the revamp version, The Adventures Continue, opening. What I love most about this photo isn't the original signage or the AT-AT model on display with Imagineers, it is the fact that all of the foliage hasn't grown up around the AT-AT yet, allowing its menacing size to be on full display. 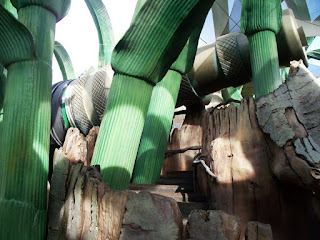 Today, as we await our first true adventures on the planet of Batuu, we celebrate a look back at a time when we had no Star Wars attractions and were anxiously looking forward to Star Tours opening. Happy Star Wars Day everyone! May the Fourth be with you! As we await the arrival of Starspeeder 1000s and the next incarnation of Star Tours at Disney’s Hollywood Studios, as well as at Disneyland, today we take a giant step back. The image below offers a brief glimpse into the coming Imperial onslaught on Endor in the form of the massive AT-AT Walker. The 35-foot All Terrain Armored Transport was designed to give the appearance that it is constantly moving forward. The steel skeleton was almost completely encased with a fiberglass shell, remember the AT-AT resides in the back stage area of the park which means appearance matters, not completed entities. Although it would be erected in Florida, and unveiled to the public in August of 1989, the colossal wienie was originally constructed in California. 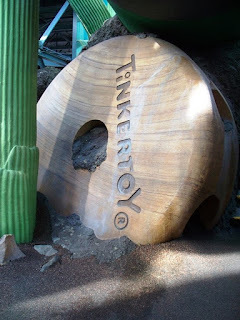 When you are in Walt Disney World there are lots of names and references to try and puzzle out. There are the obvious ones that drop film or character names in bright, bold lettering. There are those that are tucked away and reference a year or tertiary character in a clever way. There are even those times when Imaginers and other Disney staff members are given nods that you may not ever be able to suss out. Then there are those unique details that blend the real and imaginary worlds so well, it’s hard to tell what is fact and what is fiction. The produce signs that are mounted along the outside of Dockside Margaritas in Disney Springs are a perfect example of this last category. We’ll start with the easiest pair of signs to discuss, which means those placards that feature oranges and limes. 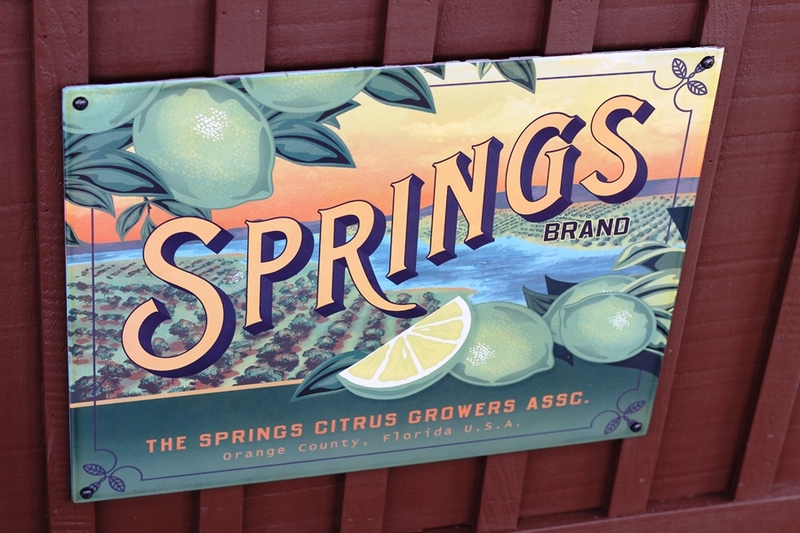 These are both attributed to Springs brand, or The Springs Citrus Growers Association, in other words Disney Springs. As the Springs are located in the real world place known as Orange County, that also happens to be where the produce is said to have come from. It is worth noting that the citrus fruits tied to Springs Brand, limes and oranges, also just happen to be the same as the designations of the parking structures at Disney Springs. The next sign is a little tougher to sort out. 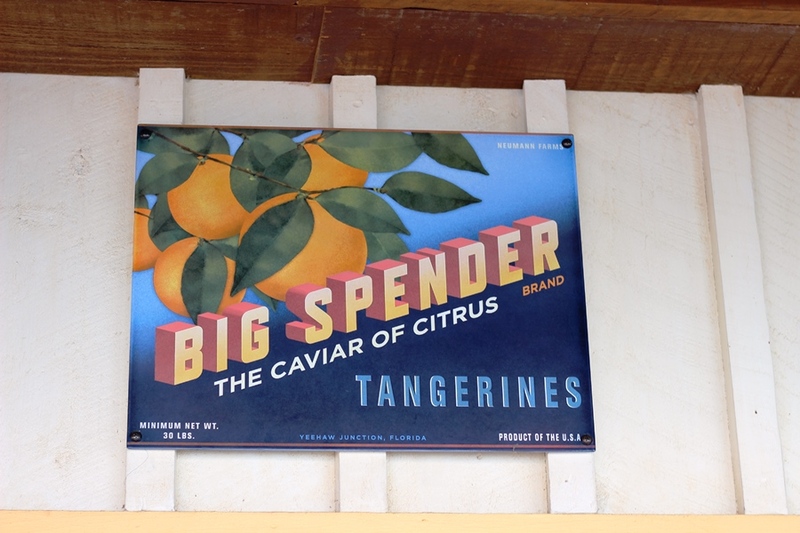 Big Spender is the farm where tangerines come from. They’re promoted as the caviar of citrus, and if either this or the name Big Spender is supposed to ring any bells as it relates to Disney, I’m drawing a blank. What I can tell you is that Yeehaw Junction, where the tangerines are supposed to have originated, is a real place. Yeehaw Juction is the home of The Desert Inn, a tourist destination now it was a trading post and restaurant in the Florida wilderness once upon a time. 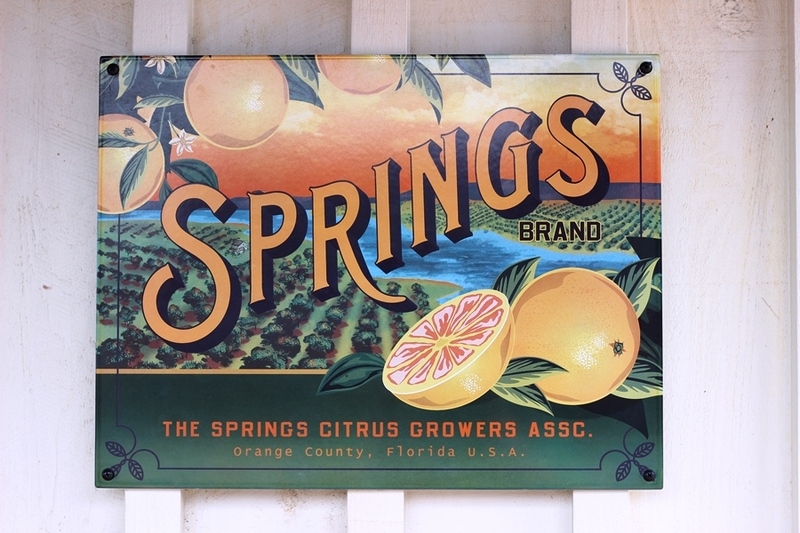 In addition to cattle and lumber moving through the trading post, I’m willing to bet citrus made its way through the trading post too. 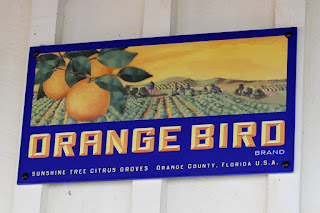 If Orange Bird Brand from the Sunshine Tree Citrus Groves doesn’t immediately conjure up images of a little cartoon bird with an orange for a head and leafs for wings, then I’m not sure where you’ve been for the past several years. The Orange Bird was once the mascot for the Florida Citrus Growers (or Commission, depending on where you are) and made appearances in Adventureland near the Sunshine Tree Terrace. As the Sunshine Tree is where the Orange Bird calls home, is it any wonder that is where the Orange Bird Brand Citrus calls home as well? 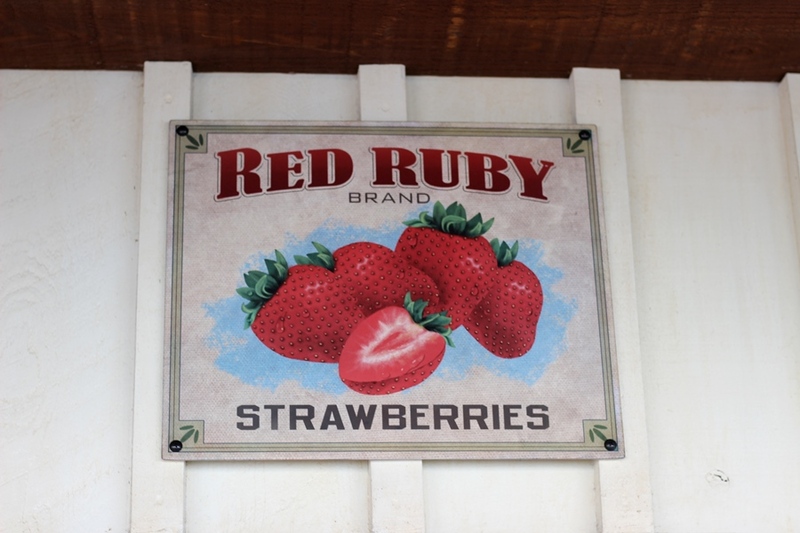 The last two move us away from citrus and towards strawberries, with the brand known as Red Ruby. 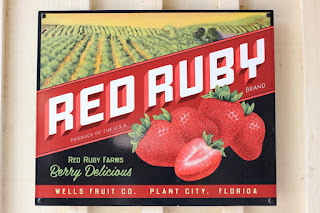 The Wells Fruit Company is perhaps a nod to former Disney President, Frank Wells, as there is no Wells Fruit Company in Plant City, Florida. While the state is known for its citrus, Plant City, and other towns in Hillsborough County, is known worldwide for its strawberries. While many places argue over who is the Strawberry Capital of the World, Plant City is definitely the Winter Strawberry Capital of the World, with the county producing 15% of the countries strawberries, and almost all of the strawberries that are available in the winter months. I should know, I spent most of my toddler years wobbling through the strawberry fields in Plant City. A little bit of truth and a sprinkling of Disney magic make the signage around Dockside Margarita something to take note of when you’re grabbing a cocktail or two and taking in the views of Disney Springs. 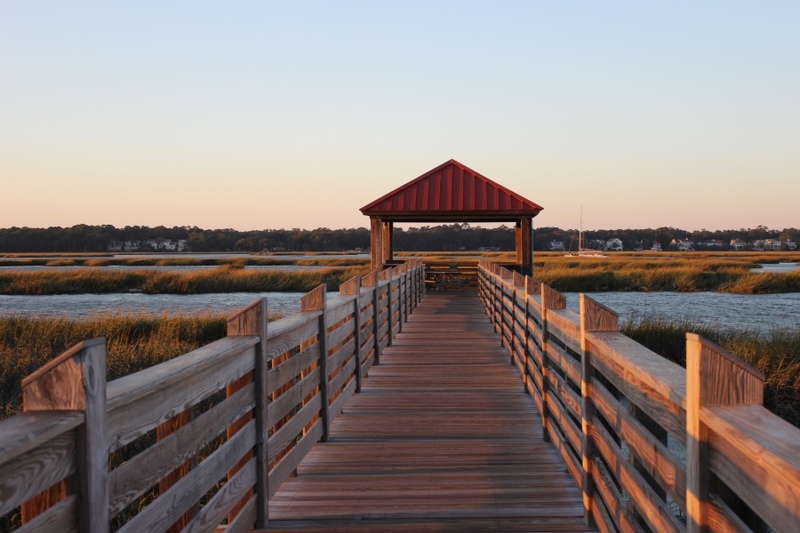 Whether you’re looking for oranges, limes, tangerines, or strawberries, this waterside shack knows where to get the best produce! Epcot is a park that features some engineering marvels and fanciful nods to real world destinations that continue to astound guests even 35 years after their creation. 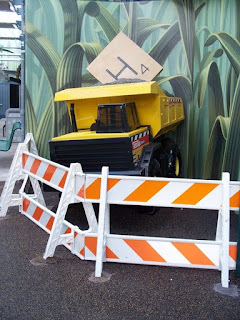 Yet, after the current overhaul of Disney’s Hollywood Studios, it is the park most in need of attention. Some attraction and shows have not aged as gracefully as others, and there are still gaps in offerings in some of the more prominent countries around World Showcase. 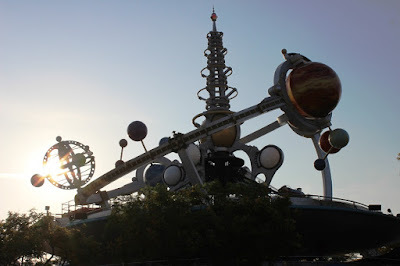 The park suffers from being caught in the middle of longtime guests remembering what was and what might have been and the unrealistic expectations of what could be to come, leaving it in a space that is entirely unmanageable. Case in point, Journey Into Imagination With Figment. This attraction, and its post-show area with interactive activities, gets dumped on with some regularity. 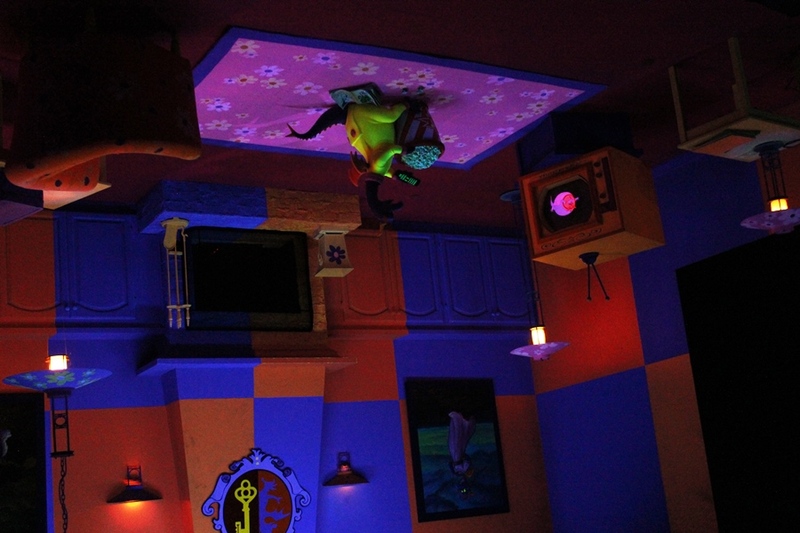 The most common complaint is that the show doesn’t live up to the original attraction, Journey Into Imagination. The attraction’s length is shorter, the innate sense of whimsy has been lost, and Dr. Channing is no Dreamfinder are amongst the rationale given for why this attraction doesn’t measure up to its predecessor. While some of this criticism is reasonable, there are things that we have forgotten, or choose to ignore, as we get further and further away from the original attraction; such as the fact that Journey Into Imagination rarely had a line towards the end of its time. To be fair, almost everyone agrees that the current version of the attraction is an upgrade from the short-lived Journey Into YOUR Imagination, but that was clearly a dark time for the Imagination Pavilion. I’m not saying that Journey Into Imagination with Figment is the best attraction in Epcot, or even the best attraction in Future World West. What I am saying is that the attraction is better than we give it credit for. The attraction moved away from artistic forms and creative thinking and focuses more on three of our five senses and how each can be manipulated to create illusions and flights of fancy. It’s a more grounded, real world approach for a concept that is clearly filled with fanciful ideas. This isn’t bad, just different. The attraction has a lot of strikes against it, but what it does have going for it is Figment. He is the soul of the Imagination Pavilion, just as he has always been. He is still the character children look to as ridiculous and does the things that they only wish they could do. Although, that said, I have seen a child lick their parent’s face once or twice, so maybe they’re a bit more like Figment than they think. He may not be creating paper animal cutouts or writing a mystery story, but he is challenging guests, particularly children, to bend their minds out of the rigidity and into a thought process that is more flexible. Plus, he utilizes gas passing as a form of humor, which most kids still seem to love. Journey Into Imagination With Figment is the version of the attraction, and the variation of Figment, that an entire generation has grown up with. 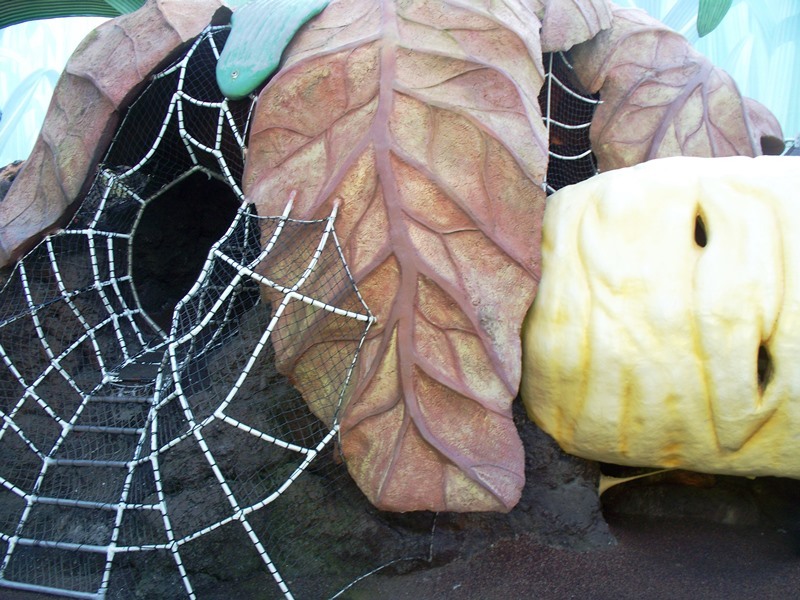 In fact, we have already had the current attraction for longer than the original was in place. That means when the pavilion goes through a revitalization process, there will be children and young adults who are sad to see it go. Just like the original, the present version doesn’t hold much of a line, but that doesn’t mean that there aren’t those who love the attraction. 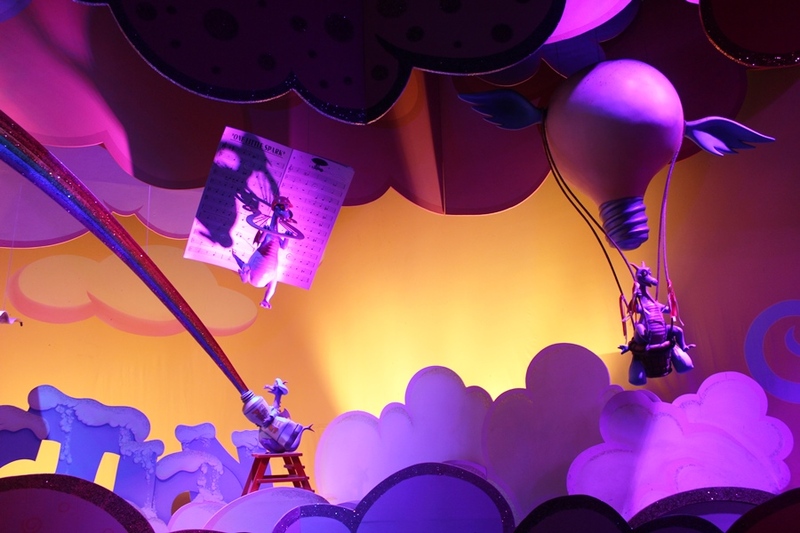 For my part, I still miss the original Dream Machine and fantastic sets, but that doesn’t mean that there won’t be elements I miss from Journey Into Imagination With Figment when it has been replaced. The butterfly illusion has been a part of the attraction since 1982, but I don’t foresee it making it through another reimagining. The nods to Medfield College, the home to many zany scientific film adventures, and the characters who called it home will also probably be replaced at some point. When the day comes that the attraction is remodeled, I hope that the Imagineers remember that Figment is still the heart of this pavilion and, to some extent, Epcot itself. I also hope all of us remember just how much we loved the original experience and are able to understand the whirlwind of emotions those who do love the current attraction are feeling and lift them up. Every attraction is someone’s favorite, and while we may not all agree, there is a value in the affection each attraction has built up.